School of Nursing students do a painful dressing change on a young Zambian boy at Lewanika General Hospital in Zambia during a 2012 practicum. There were no pain medications to give to their patient. Global Gala 2014 on Saturday, November 22, promises to be a fun-filled evening with a catered dinner, live entertainment and a silent auction. The popular annual social event also has a more altruistic goal – supporting a global initiative sending fourth-year UBC Okanagan School of Nursing students on clinical practicum experiences in isolated areas of the impoverished African nations of Ghana and Zambia. The Global Gala venue this year is Bottega Farm Inn and Studio, 4485 Swallows Rd., Kelowna. Proceeds support the practica and a variety of related projects. Some nursing activities that students and the faculty who accompany them have participated in over the past six years include: health promotion teaching in the community; teaching in the nursing schools; education on malnutrition; cardio-pulmonary resuscitation (CPR) training; hypertension research; maternal and infant health; and direct patient care in hospital settings. "Nursing is a strong voice in the global health arena,” says School of Nursing Instructor Jackie Denison, who accompanied students to Zambia earlier this year. “The Global Gala allows students to participate in these efforts." Denison recalls caring for a young boy who experienced great pain from pressure buildup in his legs, due to an accident. The only treatment was to make surgical incisions in his legs every day – without anaesthetic, due to a shortage of resources. Nursing students advocated for him to get the proper anesthetics, comforted him though these daily procedures and provided high-quality care for his wounds, says Denison. 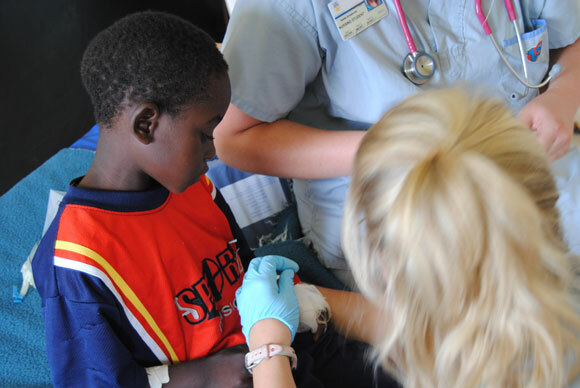 The practica in African nations are part of students’ final clinical practice learning, providing an opportunity to practice nursing in a setting outside of the Canada. This experience has had several positive outcomes for students, in terms of understanding health and healthcare systems and expanding their scope of practice. Additionally, the students will be involved with Project GROW (Ghana Rural Opportunities for Women). This UBC initiative works with rural communities providing education to girls and women, giving them the skills to create sustainable change. Global Gala contributions help purchase supplies, ranging from mosquito nets to goats, as well as supporting the community centre and health clinic. The dinner, at 7:30 p.m., will be catered by Moxie’s Grill & Bar, with live entertainment from local artist WildSon. The silent auction features original artwork, golf, hockey, spa and fitness packages and Big White passes, all donated by local businesses.